Classified as a bar cookie, brownies come in two textures: fudgy or cake-like. Fudge brownie recipes bump up the chocolate and butter amounts while leaving out any leavening ingredients for a dense and gooey result. Airier cake brownies rely on creamed butter and sugar, a higher proportion of flour and a light hand with the mixer. But whether you're a fan of the fudge or prefer to have your cake, these tips and serving suggestions can help you bake, serve and preserve a better brownie. Brownies bake best in uncoated metal pans such as aluminum, usually the 8x8-inch size, though you should follow your recipe's instructions. Using dark and nonstick metal, ceramic or glass pans generally requires you to decrease the baking time. Line the pan with parchment paper or aluminum foil to prevent the brownies from sticking and to make cleanup a snap. Only grease the parchment or foil on the bottom of the pan so the brownies can climb the sides of the pan as they rise. Toast nuts before adding them to the batter to intensify the flavor and keep them crunchy. Allow brownies to cool completely in the pan before you cut them. 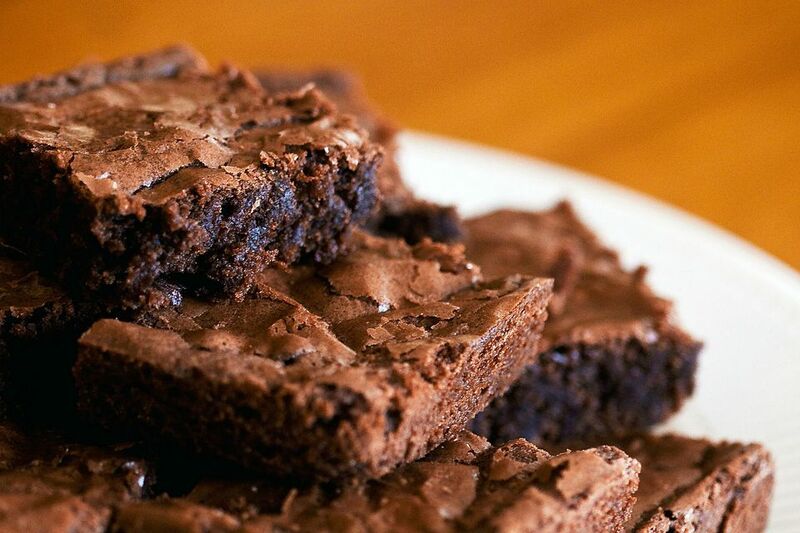 Cut cooled brownies with a plastic or table knife for smooth-sided bars. Theoretically, brownies keep well in an airtight container at room temperature for up to a week. (But does a batch ever really last that long?) Refrigerating brownies dries them out, but you can keep them in the freezer, tightly wrapped, for up to 3 months. Brownie Heart: Make any day Valentine's Day with this tasty ode to love. Drizzle chocolate syrup and raspberry sauce on a dessert plate. Cut brownies with a heart-shaped cookie cutter and place one in the center of the plate. Decorate the heart with piped whipped cream. Brownie Sandwich: Take the ice cream sandwich up a notch with homemade brownies. Depending on the depth of the brownie, either use two or slice one brownie horizontally. Soften your favorite flavor of ice cream. Set half of the brownies cut side up on your work surface. Spread about a quarter cup of ice cream onto each. Top them with the other brownies, cut side down, and press gently. You can leave them like this or optionally roll the edges in chopped nuts, sprinkles or crushed candies. Wrap the sandwiches in plastic wrap and place them on a cookie sheet. Put them in the freezer until firm, about 30 minutes. Super Brownie Sundae: On game day or any day, this sundae puts the crowds on their feet. Place one brownie square in a wide bowl. Top with one scoop of your favorite flavor of ice cream; vanilla, chocolate, mint chocolate chip and coffee all make good choices, but feel free to experiment with a more daring combination, such as dulce de leche, green tea or cinnamon. Drizzle with hot fudge sauce and sprinkle with Spanish peanuts. Brownie Trifle: Layer brownie cubes with prepared pudding, whipped cream and berries in a trifle bowl. If you don't have a bonafide trifle bowl stashed in the back of a cabinet, you can substitute any deep glass bowl or make individual parfaits in drinking glasses. Straight-Up Brownie: Cut a nice square and serve it with a glass of iced cold milk or hot gourmet coffee.